The founder of this school, ‘Izumo’, learned Chinese Kempo boxing. Today some of this is still noticeable within the techniques. Izumo Kanja Yoshiteru is also credited as being the founder of the Kukishinden Ryu Happo Hikenjutsu (Chapter 3). Above the door of Toda’s dojo, there was a nameplate, which read “Shindenfudo Ryu Jutaijutsu”. In the dojo there was a set of rules displayed for all of the students to abide by. 1. Know wisdom of being patient during times of inactivity. 2. Choose the course of justice as the path of your life. 3. Do not allow your heart to be controlled by the demands of greed, ease, or pain. 4. Sorrow, pain, and resentment should be regarded as natural qualities to be found in life. Therefore, work to cultivate an inmovable spirit (heart). 5. Hold in your heart the importance of family loyalty, and aspire greatly for the ways of the pen and the sword with balanced determination. Observing the 5 rules above is the law of the Dojo. 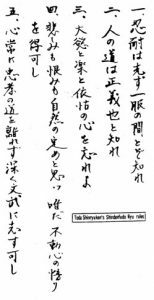 Written at New Year, Meiji 23 (1891). The secret principle of Shindenfudo Ryu is the “Principle of Nature”. Dakentaijutsu and Jutaijutsu. In the Dakentaijutsu there are no formal kamae and the use of natural posture is emphasized, while in the Jutaijutsu there are 5 kamae. Hojojutsu is also taught in this Ryu-ha. It is used along side the taijutsu, to help restrain the opponent. The school uses several different types of yari, ono (war axe), O-tsuchi (war hammers), and naginata.